Automotive Insulation - Learn Why You Need It! There are many uses for Dynamat Car Soundproofing material. 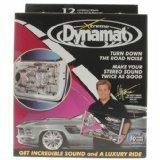 Dynamat can be used for auto sound deadening, soundproof door, automotive insulation, and may be used for many other locations on a vehicle. This material can be used on vehicles to reduce noise and vibration. Dynamat is endorsed by Chip Foose from Overhaulin’ and has been the recognized leader in the sound control business since the 1980s. Below is a video that explains a few of the different uses of Dynamat car soundproofing material and demonstrates how to DIY soundproofing a door panel.